The Lakeridge girls water polo team accomplished one of its greatest season goals on Saturday. 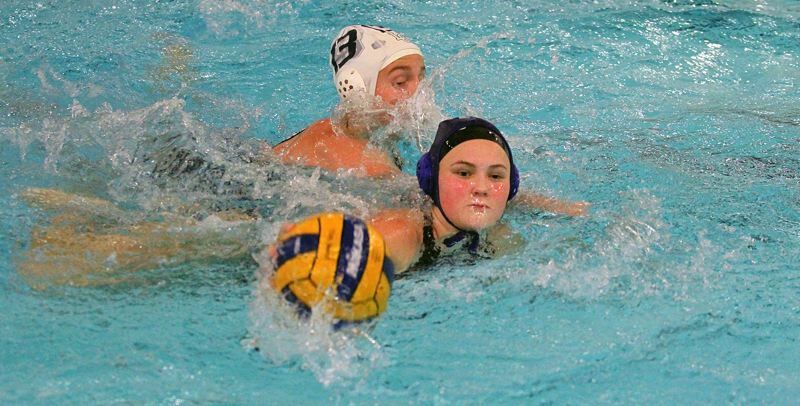 The Pacers went 1-1 in Saturday's Oregon High School Water Polo state playoffs at Osborn Aquatic Center in Corvallis, and in the process, secured a top-eight finish and a berth in this weekend's state championship event at Tualatin Hills Aquatic Center in Beaverton. "They are excited to work this week in the hopes of upsetting South Eugene on Friday to play for a higher finish than their seeding placement," said Lakeridge coach Morgan Rauch. Lakeridge — making its first appearance at state since 2013 — is seeded seventh and will open play against No. 6 South Eugene at 8:40 a.m. at Tualatin Hills; if the Pacers win their opener, they would face either No. 5 Summit or No. 8 David Douglas for fifth place at 7:30 a.m. Saturday. The state's final four includes: No. 4 Lincoln vs. No. 1 Newberg, 5 p.m. Friday; and No. 2 Barlow vs. No. 3 Reynolds, 6:10 p.m. Friday. The state championship game is scheduled for 5:45 p.m. Saturday and the third-place contest for 12:30 p.m. Saturday. In the Pacers' Saturday playoff at Osborn, Lakeridge opened with a 16-10 win over 10th-seeded Sunset, but fell to No. 2 Barlow 17-6 later in the day. With the results, the Pacers took their season record to 12-3. Lakeridge 16, Sunset 10: The Pacers kicked off their first playoff game with a 3-1 first-quarter lead, took control in a 6-2 second period, then put the game on ice with a 5-2 edge in the third quarter that extended their lead to 14-5. "The girls played hard from the start and controlled the game versus Sunset," Rauch said. "A strong lead going into the second half allowed the starters to take a rest and for all varsity athletes to participate in the playoff game." Cascade Stensland and Taylor Rockwood set the pace against the Apollos, with Stensland racking up seven goals and Rockwood another six. The team's other scores came from Molly Glad (two) and Sydney Gore, while Delaney Snaadt took care of things in goal. Olivia Daniels led the way for Sunset with five goals, while teammate Stephanie Gardner scored twice. Barlow 17, Lakeridge 6: Second-seeded Barlow was in no mood for an upset later in the day, however. The Bruins sped out to 4-0 first-quarter lead, extended their edge to 9-2 at the half and 14-4 after three periods to earn a berth in the state semifinals. "An early matchup against second-seeded Sam Barlow dropped us out of a semifinals berth," Rauch said. "(But) the girls took the Sam Barlow matchup in stride and pulled together as a team in the second quarter to slow them down." After a scoreless first period, Lakeridge got scores from Abby DeBrine and Glad in the second quarter, from Stensland and DeBrine in the third, and Stensland and Campbell Drake in the fourth. Stensland and Glad finished with two goals each in the loss. Snaadt racked up 11 stops in the game. For Barlow, Amaya Leiby was unstoppable, racking up eight goals to pace her team's success, while teammate Rochelle Beavers scored four times. Goalie Emma Strobel blocked 20 Lakeridge shots in the win.